Have a question? Please ask it at the bottom of this page and I’ll do my best to answer. Then I’ll add it to the others. Q: Hi! I tried to find El Hoyo on Google Earth but the only one that came up is a village near Madrid. Is that it? No. I made up a name for the village to protect the villagers’ privacy. The real village is in the Almería region, in the mountains. Q: Hi Vicky, I’ve just finished One Young Fool, and I know you started writing when you were very young, but WHY do you write? I think it’s an addiction, haha! Whenever I finish a book, I’m exhausted and I say to Joe, “Never again. That’s the last.” But I’m soon ready to start again. I can’t take life very seriously, and when I see people smiling, or better still, laughing out loud as they read my stuff, that absolutely floats my boat. Q: A friend of mine recommended your book Chickens, and I loved it. I laughed all the way through, even more at the end than at the beginning! Did they really call you ‘Schindler’ at work because you’re always writing lists? Q: Did you really knock over the village fountain? Q: Hi there! Your characters are a hoot! Do they know you’ve written about them? Some do, others don’t. Nobody in the village speaks English so I’ve never mentioned the books. As far as I know, they don’t know I’ve written about them, but of course my friends and family are fully aware. Q: What did your sister and her husband say when they read about themselves in the book? Ah, the Eco-Warriors… I have to admit, I was a bit nervous about showing them those chapters… But they were fine about it. They said in real life they’re much worse than I’d described, so that was okay…phew! Q: Hello Vicky, how difficult did you find it settling into such a small Spanish village? You didn’t speak any Spanish, did you? Hello there, not difficult at all, everyone made us so welcome. But we had to get by in Spanish very quickly or life would have been much harder. Q: What was most different from life in England? Q: Hi Beaky! I have to ask about the chickens. I can’t use the words here, but were those REALLY their names? If so, why? Sadly, those were their real names, yes. I blame Joe. They were black chickens, very curious – much more so than their brown and white sisters. They were always investigating our shoelaces, (probably thought they were worms) so Joe kept tripping over them. Hence the names. Not intentional, but they kind of stuck. Q: Hi Victoria, I’ve always kept chickens and I fully understand why you had to part with Cocky. Was he as bad as you described? He was much, much worse. He was the most ferocious little creature I have ever come across, except perhaps for Tasmanian Devils which have pretty bad reputations. We really missed him though. Q: Those little matchstick-men you use as scene breaks. What are they? Ah, the Indalo, the Rainbow Man. That’s the emblem for the region, you’ll see it everywhere in the Almería region; as statues on roundabouts, on car bumpers, on tourist souvenirs and in people’s houses. As I explain in the book, if you buy one and give it to someone else – it’s supposed to bring them luck. But if you buy one for yourself, that’s VERY bad luck. I’m not superstitious, or I wasn’t until I came across the Rainbow Man. You read in the book what happened to us when I bought one for myself! I won’t be doing that again in a hurry! Q: Hi, I love your recipes. Where did they come from? A variety of places, mostly the village ladies. Many came from Gayle at Orce Serrano Hams. They are superb cooks and test-drive each recipe before they are posted on their blog. Other recipes came from characters in the book, and in Two Old Fools on a Camel, Nadia Sawalha donated a lot. Q: I tried the Crispy Potatoes – Patatas Bravas recipe. Have to say, it was delicious and I’ve added it to my own recipe collection. Good, we like that one, too. I just love the whole Spanish Tapas idea. Little bits of this and that – yum! Q: Have you ever regretted moving to Spain? Never. Not for a moment. Q: Do you have plans for any more books in the future? Oh yes! The Old Fools series hasn’t finished yet. Every day I gather more material, and I jot things down. Joe’s book, One Young Fool in South Africa is now finished *pinches herself – I never thought he’d get it finished! * and Two Old Fools in Turmoil is in the pipeline. Also, the Sixpenny Cross series keeps growing. Q: Hi Victoria, I’ve just discovered that you’ve written another series, apart from the Old Fools. Is the Sixpenny Cross series based on where you grew up as a child? Hi! 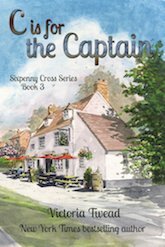 Sixpenny Cross is a fictional village in Dorset, but many of the characters are inspired by people I have met during my life. The name of the village was inspired by the name Sixpenny Handley. I was born and raised in Dorset and I adore those Dorset names, like Puddletown and the River Piddle! Ok, loving this new website and all the fun insights. Can’t wait for the B book. 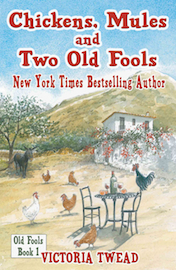 I have bought and thoroughly enjoyed every book in the “Old Fools” but am so disappointed that I cannot get the Spanish Recipe book or your latest stories in proper book form. I prefer to have a sheet of paper to all this kindle,malarchy. sorry call me old fashioned if you must but I’m sure I’m not the only non-technophobe. Hi Vicky, I just finished “chickens” and am dying to try a bunch of the recipes. How can I find them without starting at the beginning and going page by page? Thanks, Melissa. Hi Vicky, I’ve just finished reading your books for the second time. When will Two Old Fools in Tutmoil be out? No, the ‘ordinary Sussex town’ was not invented, Chris. 🙂 It’s an unspectacular seaside town, much smaller than Brighton but not far from it really. We have not read book in ten years. (not for ourselves anway). I read these 4 book aloud and all of us enjoyed. BUT where at a loss when Felix passed . 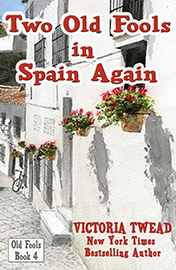 Did you leave Spain for good, do we find out in the other books. Just love your books. I also love your recipes for Spanish food. Try as I may, I cannot find your recipe for a Spanish stew with either some sausage or chorizo added. Could you please send me the recipe via email? Also don’t remember whether the main ingredient was meat or chicken. Hello Sonia, was it this one? Gayle: Chicken and chorizo is a typically Spanish combination, and this recipe uses Iberico chorizo as a key ingredient in this Spanish casserole. The dish is cooked in a large terracotta cazuela (or casserole dish), combining tomatoes, plenty of garlic, peppers and herbs. There is also the addition of split marinated olives, providing an Andalucian flavour. Victoria: This is a warming dish at any time of the year, but especially good as a winter meal on a cold evening. 1) Preheat the oven to 180C/350F/Gas Mark 4. 2) Part the chicken into thighs, drummers, wings and breasts. 3) Cut the breast in half and place into the cazuela. 4) Drain the juice (from the tin of tomatoes) into the cazuela. 5) Roughly chop the tomatoes (using a blunt/serrated knife, or squeeze with your hand). 6) Remove the stones from the split olives. Tear the olives in half and add to the casserole. 7) Add the rest of the ingredients to the cazuela and thoroughly hand-mix. Ensure all the chicken is covered. 8) Season and cook in the oven for 1 hour 35 minutes. 9) Serve, Spanish style, by placing the cazuela on the table centre, together with seasonal vegetables or mashed potatoes. I’ve just started reading One Young Fool in South Africa and there is a mention of a Leslie and his brother Martin at Johannesburg Children’s Home. I’m pretty sure that is me and my brother. Over the last couple of days I have read and thoroughly enjoyed “A for Abigail” and “B for Bella”. I loved them both and the style in which they were written. Do you have an idea when the next one ( C for Captain) is coming out? Just discovered Chickens, Mules and Two old fools and i had to get in touch to say what a wonderful book i read it in Two Days. Me and my Wife love Spain and you did what we would love to do …Very Brave…..Cant wait to get my hands on the next book. Hi Vicky, sorry – it’s an IT problem here. I was receiving the email updates but nothng for months..and certianlly not the one last week. Have tried to re-subscribe..but it keeps telling me I am already subscribed..any thoughts? Apologies of ths is not the correct place to ask. I’ve overdosed on “Chickens” and all the other books over the last few days. Addictive and pure delight! I know exactly what you describe in such an entertaining way because I’ve lived it myself, thirty years in Spain starting in the mid 1960’s, it all rings very true. Just to clarify, for anyone who thinks you may be slightly exaggerating so as to “jazz it up” for the book, no, it is all very very true to Spanish everyday life. My story will remain untold but the next episode of yours is eagerly awaited. Hello Kathryn, sorry I’m so late responding, I’ve only just caught up with the latest comments. 🙁 Thanks for the very kind words, and I’m so pleased that you’ve enjoyed my scribbles, and even more pleased that they brought back good Spanish memories for you. Yes, living in a Spanish village is a crazy experience! Hi , just finished the latest village instalment, loved it as much as all the other village books. My wife and I have visited and stayed in many of the Spanish white villages , one of our favourite ones being Torrox pueblo. So much of your books remind us of our own experiences, the characters, and the things that go on in village life. Please let us know when your next book is ready. “Two Old Fools in Turmoil” is the next in the series, and will be launched later this year, thank you for asking. I’ll definitely be announcing it here on my website, on my Facebook pages and in the usual Old Fools’ Updates newsletter. Thanks for that, looking forward to next instalment. Worried about Joe, hope everything goes ok.
Hello Flora, I’ve only just seen this message! Of course I’ll send you all my books and I hope they cheer you up. I’ll contact you via email. Thank you so much. I can’t express how much this means to me. Thank you for being such a wonderful lady. I feel like I know you and Joe from reading your books. Hello Mark, Yes, Two Old Fools in Turmoil is out in print as well as ebook, thank you for asking. If you click on the Turmoil cover, it should take you to the Amazon page. Hi Vicky, I read all your books (5) of Two Old Fools but I really would like to find out about Joe’s health and how you are doing in Australia. Will you have another book to follow “Two Old Fool’s In Turmoil? Hello Victoria. I just read all of the “Two Fools” series on a flight to Japan and back. It is great to find a good story teller. I hope you and Joe are doing well. What ever happened to the gin twins? Recently finished reading 2 O F in Turmoil, (read all your other Old Fools books), and was looking forward to reading , ‘one young fool in SA’ in electronic format. I can download it from Amazon, but then I have to sign-up for Kindle Unlimited…..which I don’t want to do. Are there other options for electronic format please? Hello Mrs Twead, Not a question; or is it, yeah, I’ll put it in question form. Why did you go and upset me at the end of your second book? I had tears in my eyes when you had to send your cute kitten to Germany. Just kidding. Getting your third book on my Kindle and looking forward to your fourth book I which I assume you will be back in Spain. I Still feel for you, I hate leaving my little Kern Terrier x Jack Russel for a month when I visit my son in Australia; Although I know she is in good care with the Mrs’s relatives she still misses us. great stories. I was going to sell up and move to Spain in 2001 after my wife died; but before I did it I met my partner and we bought a place here after selling both our houses as she wouldn’t go abroad. I am too old now (76) and I wouldn’t leave June, but your stories make me envious and I regret not moving sometimes. Please write the book D For … soon, can’t wait longer. Have bought all the other books, except recipe books, all ebooks. I am a fan of your writing. I studied the map of Spain but cannot find the village of El Hoyo. Somewhere you mentioned that from the high ground you could see the sea. Can you tell me which coastal town, obviously on the Mediterranean coast, is closest to El Hoyo, e.g. Almeria, Malaga or else? Thank you, looking forward to your new book! Thank you for your question! “El Hoyo” is a fictitious name for the village because we wanted to protect the privacy of the villagers. (As far as I know, they never knew that I wrote about the village.) If you look on Google Earth, you won’t find it. However, if you sailed close to the Spanish coast, you may well have glimpsed it high in the mountains, not far from Almeria. No problem! Just go to the Free Stuff page on this website https://www.victoriatwead.com/free-stuff/ and scroll down a little. There are five photo books to choose from, including Camel, and I’m just working on the next one for Two Old Fools Down Under. I can’t wait for Book 6 – when will it be available? Just finished my 3rd book and look forward to hearing about your life in Australia. Reading the questions I now know why I couldn’t find an El Hoyo that fitted the descriptions! I am on holiday in Alfaix 10kms inland from Mojaar and was curious as to where it is.I loved your description of obsessing about your Fitbit watch. I am also pacing around to reach 10,000 steps but seeing all that effort disappear on the stroke of midnight. I’m wondering what happened to the 27 apartment building being built across from your house. I was expecting it to alter the quiet community considerably, even if the apartments were only used for holidays. I’ve read all 5 of your Old Fool books, and feel so sorry for you having to move from your peaceful Spanish home. Now I will look forward to your new adventures in Australia. Best wishes to Joe.I hope his medical problems have imporoved.